Charlene, Princess of Monaco (née Charlene Lynette Wittstock; French: Charlène;[fn 1] born 25 January 1978) is a Zimbabwean-South African former Olympic swimmer and wife of Prince Albert II. The Princess was born in Bulawayo, Rhodesia (today Zimbabwe), the daughter of Michael and Lynette Wittstock, and the family relocated to South Africa in 1989. Charlene represented South Africa at the 2000 Sydney Olympics, with her team finishing fifth in the 4 × 100 metre medley relay. Charlene retired from competitive swimming in 2007. Charlene met Prince Albert at the Mare Nostrum swimming competition in Monte Carlo, Monaco, in 2000. They were first seen together in 2006, and Princess Charlene has accompanied Prince Albert on many of his official duties since then. They announced their engagement in June 2010, and were married on 1 July 2011. The Princess's pregnancy was announced on 30 May 2014. On 10 December 2014, she gave birth to fraternal twins Princess Gabriella and Hereditary Prince Jacques. Charlene was born on 25 January 1978 in Bulawayo, Rhodesia (renamed Zimbabwe in 1980), the daughter of Michael Kenneth Wittstock (born 1946), a sales manager, and Lynette Wittstock (née Humberstone, born 1957), a former competitive diver and swimming coach. Two brothers were born over the next five years: Gareth (born 1980), a coffeehouses businessman operating in Monaco, and Sean (born 1983), a promotions and events businessman operating in South Africa. The family relocated to South Africa in 1989, when Charlene was 11 years old. She attended Tom Newby Primary school in Benoni, near Johannesburg, from 1988 to 1991. The Wittstock family is of German origin; Charlene's great-great-grandparents Martin Gottlieb Wittstock and Johanne Luise née Schönknecht emigrated to South Africa from the Pomeranian village of Zerrenthin in northern Germany in 1861 to escape hardship. In South Africa, the Wittstocks worked as handyworkers and unsuccessfully prospected for diamonds. Gottlieb's son, Heinrich Carl Wittstock married Olive Florence Caldwell, of English origin. Their son Dudley Kenneth Wittstock, Charlene's paternal grandfather, married Sylvia Fagan Nicolson, also of mostly English origin. Charlene was given a certificate in 2014 which verified her Irish ancestry. Michael Wittstock announced in April 2011 that he was considering moving the family from Benoni to Monaco because of the increasing crime rate. Charlene won three gold medals and a silver medal at the 1999 All-Africa Games in Johannesburg. She represented South Africa at the 1998 and 2002 Commonwealth Games, winning a silver medal in the 4 × 100 m medley relay in the latter competition. She also was a member of the South African women's 4×100 m medley team at the 2000 Summer Olympics, which finished fifth. Charlene finished sixth at the 2002 FINA Short Course World Championships for the 200 m breaststroke. She left her Durban-based team (the Seagulls) to join the Tuks Swimming Club at the High Performance Centre of the University of Pretoria. She never enrolled in classes. The Club sponsored her by providing her with free access to their pools, free coaching, accommodations, and gymnasium access. She decided to leave Pretoria in January 2005, and returned to Durban; she then went to the north coast of KwaZulu-Natal, where she joined a former University of Pretoria swimming coach, Brannislav Ivkovic. On 13 April 2007, Charlene regained her title as South Africa’s 50 m women’s backstroke champion when she completed the 50 m backstroke final at the Telkom SA National Aquatic Championships in 30:16 seconds, to finish third behind Australia’s Sophie Edington and Brazil’s Fabíola Molina. Over the years she has won several national titles. She planned to compete in the 2008 Summer Olympics in China, which she said would be her swansong, but she did not qualify. Previously she had been out of competitive swimming for 18 months with a shoulder injury. Charlene said she would be swimming in Europe in the near future, hoping to improve her times. "I have a year left of competitive swimming, and I just want to be the best I can be in that time. After that I want to get involved in charity work, and development work with athletes' commissions". On 27 May 2011, the Special Olympics announced that Charlene had become global ambassador for the movement, charged with promoting respect and inclusion for people with intellectual disabilities to a worldwide audience. Charlene has said that the Special Olympics movement is close to her heart because, as a former athlete, she values its role in "using the power of sport to change lives". Charlene met Albert II, Prince of Monaco, in 2000 at the Mare Nostrum swimming meet in Monaco. They were first seen together in 2006. They went public at the opening ceremony of the 2006 Winter Olympics. Charlene moved in with Albert in 2006. She accompanied him to the weddings of the Crown Princess of Sweden in 2010 and of the Duke of Cambridge in 2011. On 23 June 2010, the palace announced the engagement of Charlene and Albert. Charlene, who was raised a Protestant, converted to Roman Catholicism, even though this is not a requirement of the Constitution of Monaco. The future princess was also instructed in the French language and the Monégasque dialect, and became familiar with European court protocol. The Prince presented her with an engagement ring featuring a pear-shaped three-carat diamond at the center and round diamond brilliants surrounding it. This engagement ring was reported to be created by Parisian jeweller Repossi. The wedding was originally scheduled for 8 and 9 July 2011, but was moved forward to prevent a conflict with the International Olympic Committee (IOC) meeting in Durban on 5–9 July. The couple had invited members of the IOC, including president Jacques Rogge, to their wedding. The couple attended the IOC meeting; hence Charlene's first foreign visit as princess was to her childhood home, South Africa. During the week before the wedding, the palace denied reports that Charlene had been getting cold feet. French weekly L'Express reported that Charlene tried to leave Monaco on Tuesday, 28 June, after rumors surfaced that Albert had fathered a third illegitimate child. The report claimed that Monaco Police intercepted her at Nice Côte d'Azur Airport, confiscated her passport, and that it took "intense convincing" by Albert and palace officials for her to agree to stay. The palace called the stories "ugly rumours" born out of jealousy. The couple were married in a civil ceremony on 1 July 2011 in the Throne Room of the Prince's Palace. Wittstock was reported to be in tears during the wedding. The Nuptial Mass on 2 July was a lavish affair presided over by Archbishop Bernard Barsi. Only days after the beginning of the couple's honeymoon in South Africa, several newspapers from Spain, Britain, and elsewhere reported that Charlene and Albert were not staying at the same hotel, but were in fact booked in different hotels several miles apart. These reports fueled rumours about the couple's marital crisis that had sparked even before their wedding. On 30 May 2014, it was announced that the Princess was pregnant. It was confirmed on 9 October 2014 that the couple was expecting twins by the end of the year. On 10 December 2014, her twins were born at The Princess Grace Hospital Centre. Princess Gabriella was born first, followed by Hereditary Prince Jacques, who is heir apparent to the throne. Charlene's advisor is Corinna zu Sayn-Wittgenstein. Princess Charlene is involved in the following organizations: Princess Charlene of Monaco Foundation, Ladies Lunch Monte-Carlo, Special Olympics, Nelson Mandela Foundation, asfAR, The Giving Organisation, and Monaco Against Autism. She regularly participates in fund raising events for charities such as amfAR. Since June 2012, Princess Charlene has been the patron of AS Rugby Monaco. In 2016, she accepted to become the patron of the South African Red Cross Society and attended the World First Aid Day in Geneva, as ambassador of the event. She also created Princess Charlène of Monaco Foundation. 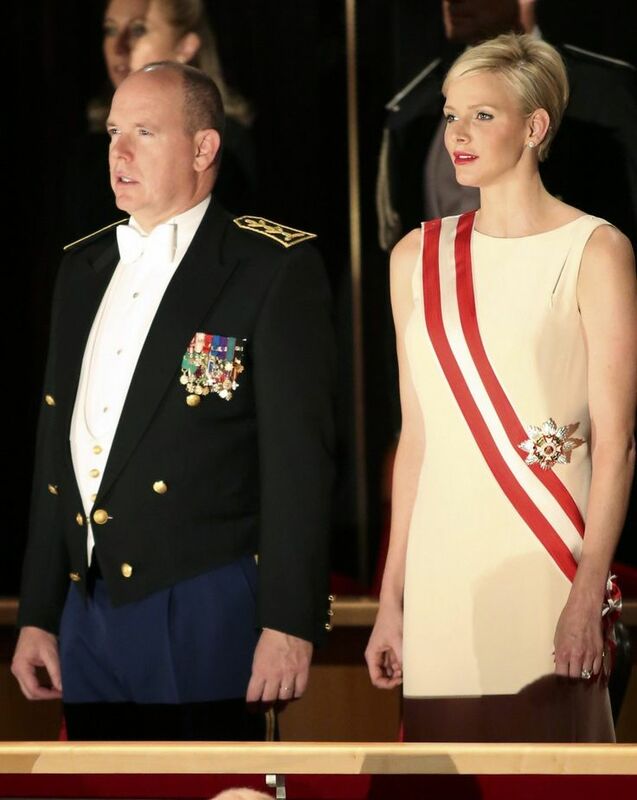 Since her marriage, Charlene has been styled as Her Serene Highness The Princess of Monaco. The previous holder was her mother-in-law, Grace Kelly, who died in 1982. ^ Since her marriage, her name has been Gallicised by adding a grave accent to her name in French documents. ^ a b Palais Princier de Monaco. "Prince's Palace of Monaco". Palais.mc. Archived from the original on 8 May 2016. Retrieved 29 April 2016. ^ "H.S.H. PRINCESS CHARLENE". Palais Princier de Monaco. Retrieved 27 November 2018. ^ "Monaco's Prince Albert weds South African Charlene Wittstock". BBC. 1 July 2011. Archived from the original on 16 November 2017. Retrieved 16 November 2017. ^ a b c d e f "Monaco's Prince Albert weds South African Charlene Wittstock". BBC News. 1 July 2011. Archived from the original on 30 June 2011. ^ Palais Princier de Monaco. "Palais Princier de Monaco". Archived from the original on 4 July 2011. Retrieved 29 April 2016. ^ a b c "Biographical details for Ms. Charlene Wittstock". Princely Wedding Monaco 2011. Archived from the original on 26 July 2011. Retrieved 2 July 2011. ^ "After William and Kate's wedding, preparations for royal wedding of Prince Albert of Monaco begin". International Business Times. Archived from the original on 7 July 2011. Retrieved 2 July 2011. ^ (in French) "Qui est Gareth Wittstock, le parrain de la princesse Gabriella ?". Paris Match. 10 May 2015. Archived from the original on 27 July 2017. Retrieved 21 July 2017. ^ "Meet Aiva-Grace, Princess Charlene's adorable new niece". You.co.za. 2 June 2016. Archived from the original on 26 October 2016. Retrieved 21 July 2017. ^ "Charlene Wittstock remembered at former primary school". Times LIVE. Archived from the original on 6 July 2011. Retrieved 2 July 2011. ^ "Charlenes Wurzeln Vorfahren kommen aus Zerrenthin". n-tv (in German). 19 June 2011. Archived from the original on 22 June 2011. Retrieved 2 July 2011. ^ "Wittstock" (PDF). Ancestry 24. Archived from the original (PDF) on 14 January 2013. Retrieved 29 April 2016. ^ "Princess Charlene of Monaco's Irish ancestry revealed". Independent.ie. Retrieved 31 July 2014. ^ "Charlene Wittstock's family in limbo about moving to Monaco". ZA: Looklocal. 15 April 2011. Archived from the original on 19 March 2012. Retrieved 2 July 2011. ^ a b "Apple of Prince Albert's eye makes a splash". Iol.co.za. 15 April 2007. Archived from the original on 14 February 2009. Retrieved 2 July 2011. ^ a b "Monaco's Prince Albert to marry Charlene Wittstock". Gmanews.tv. Associated Press. 23 June 2010. Archived from the original on 23 August 2011. Retrieved 2 July 2011. ^ "Fit for a princess: Prince Albert and Charlene guests of honour at Grace Kelly exhibit". Hellomagazine.com. 16 April 2010. Archived from the original on 24 September 2015. Retrieved 29 April 2016. ^ "Baile de la Rosa con sabor marroquí". Lne.es. Archived from the original on 20 July 2011. Retrieved 2 July 2011. ^ "Monaco's Prince Albert gets engaged". CNN. 23 June 2010. Archived from the original on 21 October 2012. Retrieved 2 July 2011. ^ "Prince Albert of Monaco engaged to Charlene Wittstock". BBC News. 23 June 2010. Archived from the original on 27 June 2010. Retrieved 2 July 2011. ^ "Marriage Princier 2011 Website, Frequently Asked Questions". Mariageprinciermonaco2011.mc. Archived from the original on 23 April 2011. Retrieved 26 April 2011. ^ "Why Princess Charlene of Monaco Converted to Catholicism and How She Finds 'Spiritual Balance' in Church". Archived from the original on 7 June 2017. ^ "Crown jewels: The fabulous rings which sealed the love of Europe's royal couples". HELLO! magazine. UK. Archived from the original on 16 January 2013. ^ a b "Prince Albert and Charlene change wedding date". Hello!. 2 August 2010. Archived from the original on 6 June 2011. Retrieved 2 July 2011. ^ "Monaco's three-day royal wedding kicks off". Nine News. 1 July 2011. Archived from the original on 2 July 2011. Retrieved 1 July 2011. ^ a b "Prince Albert of Monaco weds Charlene Wittstock". Associated Press. 1 July 2011. Archived from the original on 4 July 2011. Retrieved 1 July 2011. ^ "Prince Albert Reportedly Had Charlene Wittstock's Passport Confiscated: Monaco's Runaway Bride Going Nowhere Fast". International Business Times. 30 June 2011. Archived from the original on 2 July 2011. Retrieved 30 June 2011. ^ "Monaco prince marries South African swimmer". Reuters. 1 July 2011. Archived from the original on 3 July 2011. Retrieved 1 July 2011. ^ News, A. B. C. (8 July 2011). "Honeymoon Over for Monaco's Royal Couple?". ABC News. Archived from the original on 29 January 2018. ^ "Alberto y Charlene: luna de miel en hoteles separados | Gentes!". Elmundo.es. 13 July 2011. Archived from the original on 1 June 2016. Retrieved 29 April 2016. ^ "Los Príncipes de Mónaco pasan su luna de miel en hoteles separados". ABC.es. Archived from the original on 2 June 2016. Retrieved 29 April 2016. ^ Allen, Peter (13 July 2011). "Princess Charlene of Monaco 'spent honeymoon 10 MILES away from Prince Albert' | Daily Mail Online". Dailymail.co.uk. Archived from the original on 1 August 2012. Retrieved 29 April 2016. ^ "Monaco confirms: Princess Charlene is pregnant with twins". Royalista.com. 9 October 2014. Archived from the original on 21 October 2014. Retrieved 21 October 2014. ^ "Monaco's Prince Albert II and Princess Charlene expecting baby". BBC News Europe. Retrieved 30 May 2014. ^ "La princesse Charlène est sur le point d'accoucher à Monaco". Monacomatin.mc. Retrieved 10 December 2014. ^ Eun Kyung Kim (10 December 2014). "Monaco's Princess Charlene, Prince Albert, welcome twins!". TODAY.com. Archived from the original on 10 October 2015. Retrieved 29 April 2016. ^ "Princess Corinna zu Sayn-Wittgenstein Visits Russia | highsocietytimes". Highsocietytimes.wordpress.com. Archived from the original on 25 March 2016. Retrieved 29 April 2016. ^ Flantzer, Susan. "Princess Charlene of Monaco". Unofficial Royalty. ^ a b c "H.S.H. PRINCESS CHARLENE". Palais Princier de Monaco. Retrieved 27 November 2018. ^ "Biography". Prince's Palace of Monaco. Archived from the original on 4 July 2011. Retrieved 1 July 2011. ^ "N° 8096 du VENDREDI 23 NOVEMBRE 2012 * Ordonnance Souveraine n° 4.038 du 17 novembre 2012 portant élévation dans l'Ordr". www.legimonaco.mc. Archived from the original on 13 January 2013. ^ "Photographic image" (JPG). S-media-cache-ako.pinimg.com. Archived from the original on 4 March 2016. Retrieved 29 April 2016. ^ "Princess Charlene Wore Wrap Dress during Monaco's National Day Celebrations" (JPG). D.ibtimes.co.uk. Archived from the original on 4 March 2016. Retrieved 29 April 2016. ^ "Photographic image of Princess Caroline of Monaco and family" (JPG). Hellomagazine.com. Archived from the original on 24 September 2015. Retrieved 29 April 2016. ^ "Le couple princier est arrivé en Pologne | Actualités". Nice-Matin. 18 October 2012. Archived from the original on 8 July 2015. Retrieved 2016-04-29. ^ "Internetowy System Aktów Prawnych". Isap.sejm.gov.pl. Retrieved 29 April 2016. ^ "Onorificenze - Dettaglio del conferimento". Quirinale.it. 20 February 2014. Archived from the original on 5 March 2016. Retrieved 2016-04-29. ^ "Prince's Palace of Monaco". Palais.mc. Archived from the original on 5 March 2016. Retrieved 29 April 2016. Wikimedia Commons has media related to Charlene, Princess of Monaco.